Nice job, Ken. Very informative. 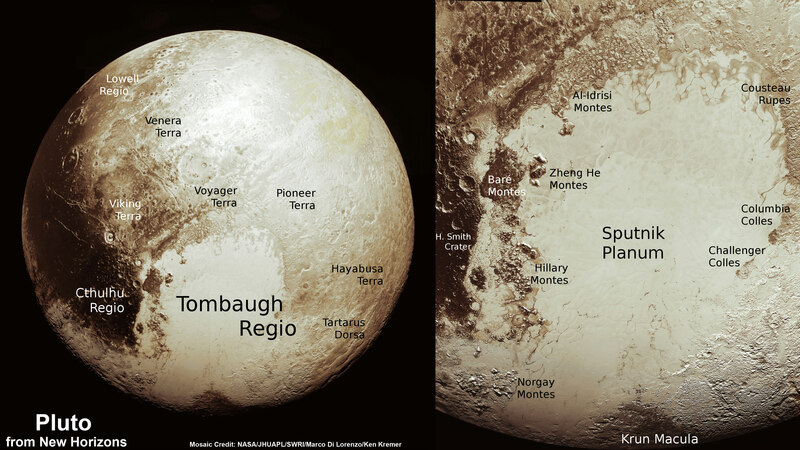 I hope the IAU lets the New Horizons names for features on Pluto stand. They are very fine names. Looking forward to more data from our little American bird in the sky. Nice story. However, Mr. Wrathell is incorrect in implying that IAU is doing anything to accept or reject Pluto science team Pluto system feature names. Pluto science team has refused to submit proposed names to IAU, which has been asking for names for six months. Actually, it’s worse than that – procedure is to agree on name themes first, and Pluto team has not responded to IAU comments concerning their proposed themes. During same period, Dawn science team has established name themes, proposed ~70 names, had 18 approved so far. Ceres is example of how it usually goes – swift and painless. Motives of New Horizons science team for delay and use of unofficial names are unclear at this time. Why have we not heard this before now? Corey Powell at DISCOVER covered some of this. He fell into the “New Horizons team = heroes/IAU = evil byzantine bureaucracy” trap, but his story – published online about a week back – contains some truths. Anyway, the IAU nomenclature group is small and very busy. They routinely accept proposals for names for features all over the Solar System. Mars and Mercury features get new names every week with little fuss and I saw a new Ganymede feature name recently. Many sciences have nomenclature groups – there’s one that governs rock layer names, for example. The idea is that someone has to keep track of all the names to avoid confusion. It’s really about clear scientific communication across many languages. Such groups generally have rules and procedures based on decades of experience. The IAU nomenclature group is no exception. So, for Solar System naming, the procedure is to get the mission team to propose name themes, get those approved in collaboration with the IAU nomenclature group, and then generate lists of names based on those themes, again in collaboration with the IAU nomenclature group. This is normally done before the names are required. For Pluto, we have tentative name themes and no name banks. The New Horizons team broke off discussion shortly after the IAU noted that one of their themes – vessels of exploration – had already been used on Mercury and Mars, leaving few names for the Pluto system. Convention is to avoid repetition in order to avoid confusion. That said, convention is not set in stone. Tombaugh has a crater on Mars, a world he studied far more than Pluto, but if the Pluto team formally proposed Tombaugh Regio, it’s highly likely that it would be approved. I know that because there was some preliminary discussion to that effect, and Corey’s article quotes an IAU nomenclature person as confirming it. Basically, where we are now is the IAU is waiting on the Pluto team. I do not know how long they will wait. There is precedent for the IAU naming features without spacecraft team participation. For example, they routinely name features first seen in Viking, Mariner 10, or Voyager images without consulting with those mission teams. But those teams do not exist (except in the case of Voyager, but the emphasis has shifted to the interstellar mission). The New Horizons team does exist but is missing in action. And that’s where it stands. New Horizons is in many ways different from Dawn. The mission team might be waiting until they get all the data back before submitting it as one large entry. There likely are features on Pluto, Charon, and the small moons that have yet to be discovered. The NH Team might want to link these features with one another through choices of informal names, mirroring the way they geologically connect with one another. The informal names currently being used–and the mission team describes them as “informal”–were all taken from the “Our Pluto” project, a naming initiative the New Horizons team conducted in conjunction with both the IAU and the SETI Institute. The IAU is already part of the process, having signed on to this initiative. One of the project’s goals was to conduct outreach and stimulate public interest in New Horizons and in the Pluto system, which, judging by the number of people who participated and submitted names, was tremendously successful. Unfortunately, at this year’s IAU General Assembly, the only mention of the New Horizons mission and Pluto discoveries came in the form of a newspaper article criticizing the mission team for using “unofficial” names for these worlds’ features. That is a slap in the face to the mission. This team was the first to ever successfully send a probe to Pluto, yet the only mention of their accomplishment at a major astronomy conference was criticism over use of names??? The New Horizons team, not the IAU, sent a probe to Pluto. That accomplishment alone should naturally give the team priority in selecting names for their discoveries. If some features do end up having more than one name, it’s not a big deal. Many stars are known by several designations, such as Sirius, which is also known as the Dog Star and as Alpha Canis Majoris. On several occasions, the IAU has been inappropriately heavy handed in its insistence on maintaining its perceived “authority.” The organization even refused to use names for lunar features given by Apollo astronauts who had actually walked on the Moon! If the IAU really believes in its mission of “safeguarding the science of astronomy,” it should welcome both robotic and manned exploration projects instead of getting involved in silly rivalries with their mission teams. The explorers don’t need to ask anyone for permission. Their names will be the norm, it is already. The IAU is irrelevant in this context. Of course, what you say is incorrect. Explorers on Earth have to get their names cleared with various geographical naming entities. These organizations do things like make sure features on maps are accurately recorded, so they are, like the IAU, very important (assuming one wants to know where things really are). Astronomers and space explorers have to clear their names with the IAU. They have done so since 1930. The planetary naming process was adopted in the 1960s and refined in the 1970s and has served every spacecraft team well. That’s more than 100 since 1957. The New Horizons team is the odd man out here; the only team to so flagrantly flout internationally accepted and long-established naming conventions. Great article and great job processing these images! The New Horizons Team has more important things to do than say “How high?” when the IAU says jump. The IAU should show some gratitude to Team New Horizons and so should you, dsfportree, instead of holding the torch for the IAU. Dostoyevsky said in Notes from Underground that the definition of Man is that he has two legs and is ungrateful. Instead of firing potshots at Team New Horizons because of your blind love of the IAU, perhaps you can pause and stop to think about the fact that Team Horizons may have had a few things more important than playing lackey to the IAU. Moreover, there has been some pretty catty comment by the IAU about Team New Horizons, not to mention Pluto itself. Mike – Incidentally, forgot to mention that I disagree with your suggestion that the New Horizons team is less competent than other space mission teams we’ve seen working over these past 50 years. I do not believe that their failure to work with the IAU on name banks is a sign that they have more on their plates than they can handle. I know several of the team members and they are highly competent people. Some of them also wonder what is going on with the name thing and make it clear when they do talks that the names being used so far are entirely provisional. I also wanted to note that a conscious choice not to go for official names could be seen as implying a lack of interest in providing the normal deliverables that come from space missions. I am not sure whether you have the background to appreciate the implications. Mike – I think you need to read more carefully what I wrote and think about it. If you have any questions after that, I’ll do my best to answer them. I don’t respond to insults, which are generally a sign of immaturity. As for gratitude, the Pluto team should be grateful to American taxpayers. Not everyone gets to explore a new world, nor name its features. Many on the team feel gratitude and understand their role. The log-jam seems to be at the top. I don’t know how you extrapolate that I suggested Team New Horizons is in any way incompetent. Please do not put words in my mouth again. Dealing with the IAU is not a high priority perhaps to some at the top given the outright hostility the IAU has shown to Pluto. I saw the sesssion in which Pluto was demoted and noted Jocelyn Bell-Burnell cutting off pro-Pluto speakers in mid-sentence and crossing her arms in contempt when one pro-Pluto speaker was at the podium. The shenanagians in Prague have been documented at length. So if some on Team New Horizons do not cater to the beck and call of the IAU, it is highly understandable. As far as gratitude goes, that is a low blow to say Team New Horizons is not grateful for the opportunity to explore Pluto. And also unsubstantiated. If you want to be an apologist for the IAU, that is your business; but they were completely out of line in Prague and the new definition reeks. I don’t blame anyone on Team New Horizon if dealing with the bureaucratic red tape of the IAU is a lower priority than the success of the mission itself. I cannot understand how you think otherwise; but I suppose some people have a natural predisposition toward an infatuation with arrogant French bureaucratic organizations. I suppose you are a big fan of the EU as well? I’m not an apologist for the IAU – whatever that means – if anything, I’m an apologist for science. You were unclear when you suggested that the Pluto team has too much to do to hammer down name themes and stock name banks. All other spacecraft teams have managed to get themes in place and establish name banks so that names they use are not “unofficial” when they needed to start naming things. I cited the Ceres team as a good example. They are running an on-going orbital exploration mission to dwarf planet Ceres with complex orbital maneuvers and yet have found the time and talent to propose ~70 names, of which 18 have been approved so far. They have quadrangle names. That’s important for beginning mapping, which is one of the ways planetary scientists communicate findings. They can write scientific papers about their findings and use real names. If you really think about it, the New Horizons team had 9.5 years to get its names in order. I doubt that fulfilling that requirement would have destroyed the spacecraft as it hibernated its way to Pluto. IAU nomenclature has nothing to do with Pluto’s status as a dwarf planet. I disagree with the dwarf planet definition because it is sloppy science, not because someone made me sad. I’m not emotionally invested in this as you appear to be. I expect that the dwarf planet definition will undergo revision – that seems to be the trend in the planetary science community, anyway. In any case, the people involved with Solar System naming are not the ones who wrote or passed the dwarf planet definition. As for “red tape,” you really are not reading what I write, are you? I explained already how the nomenclature team is small and the procedure for naming features – an essential part of doing the science, since it impacts communicating results – is typically swift and painless. It goes on continually, with new names proposed and approved for features all across the Solar System on almost a daily basis. You should be aware that the IAU – which was responsible for sorting out the nomenclature mess lunar and planetary astronomy found itself in in 1930 and making sure that it didn’t recur when we started space exploration 50 years ago – is actually highly regarded among planetary scientists all around the world. As for gratitude, I was responding to your statement – you said we should all be grateful to the New Horizons team for exploring Pluto. We are *all* exploring Pluto, and the New Horizons spacecraft and the team are our proxies. As our proxies, they have responsibilities. One is sharing data, and that’s what approved names are all about. They keep the info sharing process tidy. Folks don’t run around using multiple names for the same features. I mentioned science communication. That’s what I meant. Please, before you launch another rant, read what I have written, think it over. I am happy to try to answer any questions you have if you can pose any and remain civil. If I don’t have answers, I can get them – it’s part of my job. Just don’t ask me why the Pluto team hasn’t gotten its names in – that’s unfathomable. Mike Wrathell what is wrong with the EU? Did you fall on your head when you were a Baby? What a beautiful object. I think we can all agree on that. It’s just amazing and wonderful that humans have managed to acquire these images, kudos to everyone involved at every level. You all deserve the highest honors. I hope we are not done. Agreed. And thanks. I did my part. Seriously. I’m much more interested in what material is on Pluto, how is it made, what goes on there, than in stupid name schemes discussions between IAU and the team or their corresponding fanbases. 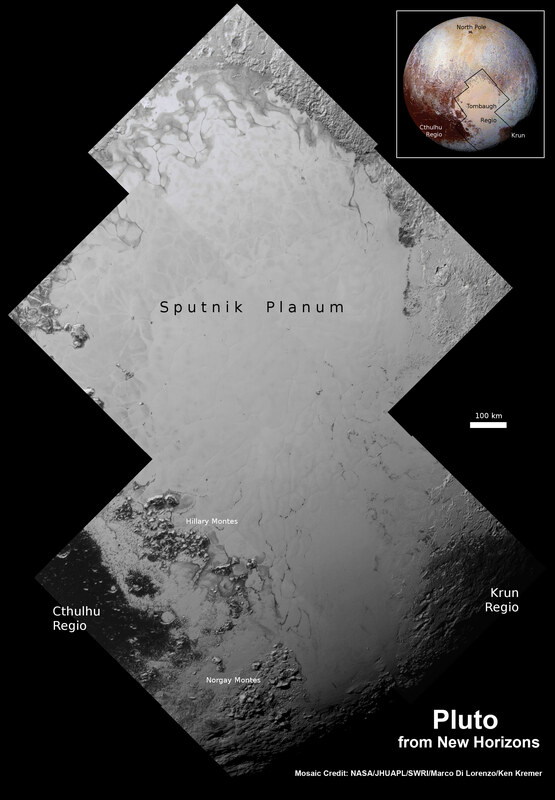 How can scientists talk/write about Pluto and its satellites without names? The New Horizons team is exploring these fascinating worlds on behalf of all humankind. Part of planetary exploration is proposing names to enable scientific communication among the thousands of planetary scientists around the world. It’s not a trivial thing, and it has nothing to do with “fanbases.” It’s about how we do planetary science. I suppose I have a different perspective – I only realized how different since I started posting here – because the facility I manage is part of the NASA-funded USGS cartographic team which maps the moons and planets of the Solar System. My facility includes a library of more than 110,000 lunar and planetary maps, almost all of which carry names which have been arrived at through the long-established IAU-managed process. Obviously, for human beings it’s more convenient to name features on ‘heavenly bodies’ than to number them. And it’s respectful and moving to honour the legacy of prominent, deceased researchers by naming features after them. Beyond that, in my view, all this discussion and controversy is just hot air and an utter waste of effort, time and money. All that matters is understanding the processes that formed the Pluto we are now seeing — and isn’t it an amazing sight? When I think that, as a boy of eight, I was given a Larousse Encyclopedia of Astronomy by my parents for Christmas, which was speculating about patches of vegetation on Mars. Nothing was known about Pluto then: just its apparent magnitude and its orbital parameters. I couldn’t care less whether Pluto is regarded as a planet or not. Don’t scientists have better things to do with their time than bickering about nomenclature? Why don’t they instead go out into the community and educate children and youngsters about the science? For example, increasing numbers of people believe the Apollo moon landings were a hoax. I’ve even seen a YouTube video which claims that New Horizon’s photos of Pluto are faked. Scientists should be out there combatting this retrograde tendency in society, not bickering childishly about what we call things OUT THERE. It damages the reputation and standing of scientists in the public eye and it’s all an irrelevant distraction from what IS important: understanding the physical and chemical processes and educating children and youngsters about them. The naming process is part of the scientific process. I’ve explained why it’s important. Imagine that we discovered a new species and the scientists involved refused to name it. That’s exactly equivalent to the issue at hand. “That new species” would not be a good label if the goal were actually to communicate scientific results. The solution is simple. Stand with Team New Horizons and use their names. If the IAU wants to remain in charge of names, they should show some respect to Team New Horizons and let them do their job without firing potshots at them. As far as scientists going out into the community to make sure a few crackpots do not put up paranoid videos on You Tube, that would be a waste of their precious time. New Horizons does do some public outreach, however. At any rate, yes, I think we can all agree that the photos and other data New Horizons is sending back to Earth is extraordinary. I hope our next President will support NASA and advocate for more funds so we can continue with exploring the outer solar system. I would like to see another mission to Pluto and one to Haumea. As far as names and categories not being important, robst247, I disagree. No one was calling Cecil the Lion Cecil the Hummingbird after that Minnesota dentist shot him. It is part of Science to call things by their proper names. Pluto is a planet. Dwarf planets should be a subcategory of planets. Many leading planetary scientists support this change in categorization. Having proper names for things goes all the way back to Genesis. It does not damage the reputation of scientists to insist on proper categorization. Just the opposite, in fact. I don’t base my ideas on emotions. Yes, I do have emotions. We all have emotions. To accuse those with whom you have a disagreement or perceived disagreement as being “emotional” is a low blow. At any rate, I hope the IAU will approve all the names Team New Horizons is using. As far as Dawn following the IAU’s rules and Team New Horizons not following the IAU’s rules, that is life in the big city. The IAU has met its match and should show some respect to Team New Horizons. Someone needs to stand up to the IAU. I am sorry this has caused your job some grief, but it is for the best. In the end, things will sort themselves out because of New Horizons carving a new path. The IAU should stop thinking it can call the shots. It should get on its knees and beg, and perhaps bark like a dog. Mike you definitely fell out of the Pram when you were a Baby! No nation should ever surrender its sovereignty. The EU is showing its impotence and incompetence as we speak regarding the so-called migrant crisis. Europe is falling apart as the EU watches without lifting a finger. The UKIP is correct in wishing the UK to withdraw from the EU. You should try speaking like a man instead of a troll. The IAU and the EU both like to dictate terms. That is not the way Science or Politics should work. Both organizations have gone beyond their authority and need to be abolished in the case of the EU, and reined in in the case of the IAU. The travesty of the St. Bart’s Massacre Day 2006 demotion of Pluto shows very clearly that the Executive Committee of the IAU has no qualms about ramrodding whatever it wishes upon the world. The EU seems to have emulated this. You are of course entitled to believe anything you want. I have tried to explain to you how the science works and have failed. Since a big part of my job is scientific communication and I do it very well, that’s an accomplishment on your part. Nice article. I understand Science. I understand Pluto needs names for its features. Pluto has names for its features. Eventually, they will become formal names. I am not going to blame Team New Horizons. They are doing a bang-up job. Without them, we would not need this back-and-forth at all. The culprits of this whole hubbub are Marsden, Brown, and the IAU. They are anti-Pluto and Team New Horizons is human. If their dander is up a bit, I cannot blame them. The IAU continues to be peevish and petulant and arrogant. What do you think of the fact that whenever someone interviewing Brown says he discoverers Eris that he never corrects them and mentions that Chad and David are also listed as co-discoverers? Do those names not matter, as long as we are talking about names. And facts are good, too. Now we know that Pluto is definitely larger than Eris. This whole hubbub should never had happened. I appreciate your support of Pluto. Pluto continues to amaze. You are splitting hairs, David. There are new names. They are informal for now. The IAU can easily formalize them. Maybe they should reach out to Team NH instead of firing potshots at them. You can get more with sugar than you can with asparagus. Previous PostPrevious How Many Moons Does Jupiter Have?